Offprint : [Langenbeck's] Archiv für klinische Chirurgie, vol. 38, 1888-89. Berlin : Deutsche Gesellschaft für Chirurgie, 1888. Description : -173 p., 14 l. ; ill.: tables h. t., 9 photo. eng., 5 chromolith. (part fold.) ; 22.2 cm. 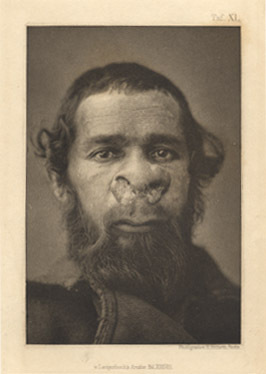 Photographs : 9 photogravures of clinical portraits. Rinoskleroma (scleroma respiratorium) s klinicheskoi, patologoanatomicheskoi i bakteriologicheskoi storon. Assistant to Professor Bornhaupt at Kiew Hospitalklinik. Wolkowitsch became the director of surgery at the Kiew Hospitalklinik. Scarce, no copies in Worldcat. Index Medicus: 11201621390 (Russian edition). This scarce dissertation is illustrated by nine masterful copperplate engravings, produced by H. Riffarth in Berlin. The first plate is a reproduction of a watercolor drawing by Professor Bornhaupt who was Wolkowitsch's mentor. 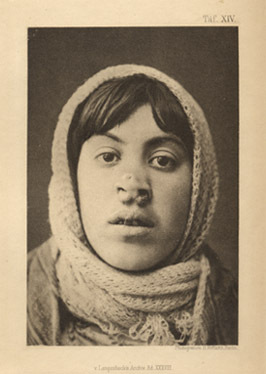 The subsequent plates are photographs including one of an infant afflicted with rhinoscleroma.